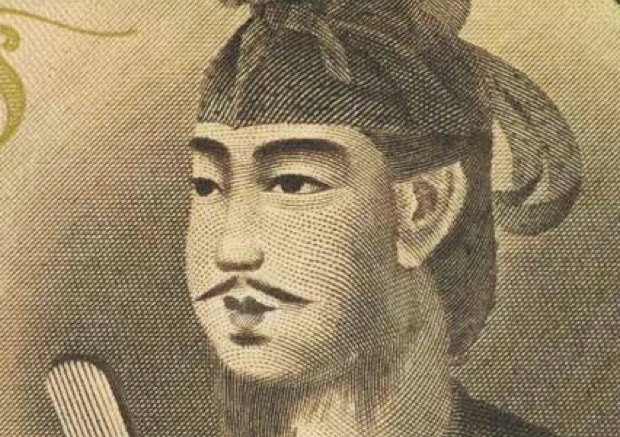 The 10,000 yen currency note issued in 1958 has a portrait of Shōtoku Taishi 聖德太子 (574-622), i.e., Prince Shōtoku. This underscores his prominence in the national history and identity of modern Japan, which is warranted given his achievements in consolidating a centralized government during the Asuka period 飛鳥 (593-710) to rule over what was a fractured and divided Japanese archipelago. At the same time he was a devout Buddhist, which in his day had only been imported from Korea a few decades prior to his birth. His support of Buddhism further strengthened the position of the Yamato court in the face of anti-Buddhist noble families at odds with the aims of the emerging central government. The chief source of information on Shōtoku is the Nihon Shoki 日本書紀, a national history of Japan completed in 720 (for the digital text see here). We are told the prince's original name was Umayado 厩戸, which literally means 'stable door'. As the story goes according to the Nihon Shoki, his mother Anahobe no Hashihito 穴穂部間人 was on an inspection tour and delivered the child without any difficulties in front of the stable door. The child could 'talk when having been born' (生而能言), which is a hagiographical element possibly taken directly from the Chinese translation of the Mahāprājñāpāramitā Upadeśa (attributed to Nāgārjuna, translated by Kumārajīva in 406) as therein is a story about Śākyamuni in a past life having been born as a prince of a great country in Jambudvīpa and immediately being able to speak.1 This of course reflects later perceptions of the prince as having been holy given his active support for the Buddhist cause. It was on this day that the emperor heard [this prophecy of the Buddhadharma going east] and was overjoyed. He addressed the emissaries, “I have never heard of such a profound teaching as this, but I will not decide myself.” He then inquired about this to his ministers and said, “The western realm has offered us the Buddha, most sublime in appearance, of which we have never had. Do we venerate him?” The great minister of the Soga clan Iname Sukune said, “The countries of the western realms all venerate him. How could abundant autumn Japan alone turn its back on this?” Mononobe Ōmuraji Okoshi and Nakatomi Muraji Kamako together stated, “The sovereign of our country has always made sacrifices to and venerated the hundred and eighty gods (kami) of heaven and earth throughout spring, summer, autumn and winter. Now to change to venerating a foreign god might invoke the wrath of the gods of this country.” The emperor said, “It should be given to the willing man, Iname Sukune, and we shall try worship.” The great ministers all knelt and accepted this, pleased. He [Iname] placed the image in a house in Oharida and diligently cultivated himself in renunciate activities as cause [for liberation] while purifying his house at Mukuhara to make it a temple. Later the country was subject to pestilence from which the people died prematurely. The longer it went on the worse it became. They were unable to remedy it. Mononobe Ōmuraji Okoshi and Nakatomi Muraji Kamako together stated, “In days past you did not require our counsel, which has led to this plague. Now should you recover things before it is too far there will certainly be blessings. We should promptly cast [the image] away and diligently pursue future fortune.” The emperor said, “As you say!” The officials then abandoned the Buddha image in the Naniwa Canal and then set fire to the temple and burnt it to ashes until nothing remained. Thereupon there was neither wind nor cloud in the sky and suddenly the great palace was aflame. The introduction of Buddhism, aside from possibly offending the sensibilities of certain kami worshippers, also heralded the introduction of other foreign intellectual and political currents based on Chinese models which presumably undermined the authority of clans in a hitherto politically fragmented society. In other words, Buddhism was as much a political issue as it was a religious one. The military victory of the Soga clan undercut earlier forces fighting the emergence of a centralized state which then subsequently ensured Buddhism's flourishing. In the same year at Suiko's enthronement, Shōtoku was made her crown prince. At the time he was around nineteen years of age, though he entered political life swiftly under the guidance of three figures, all of whom it seems were from the Korean peninsula. They included the Goguryeo 高句麗 monk Hyeja 慧慈, Kakuka 覺哿 (thought to be from Baekje 百濟) and the Silla 新羅 immigrant Hata no Kawakatsu 秦河勝. The Nihon Shoki reports that in 593, Hyeja taught the prince Buddhism while Kakuka (a boshi 博士 or erudite scholar) taught non-Buddhist (Confucian) materials, subjects which the prince mastered.2 Hata no Kawakatsu served the prince in various capacities. Later in 603 the prince bestowed a Buddha image and ordered him to build Hachioka-dera 蜂岡寺 (Kōryū-ji 廣隆寺). These three were not only his mentors, but they also provided diverse international perspectives, which likely encouraged the prince's interest in adopting mainland culture, which was a continuation of Soga clan policies. Shōtoku ensured the survival of Buddhism by building major temples. Arahaka-dera 荒陵寺, later called Shitennō-ji 四天王寺, commenced construction in 593, though the impetus for its construction was apparently a result of vows taken by Shōtoku in 587 when the Soga and Mononobe clans clashed. It was built in Naniwa 難波 (modern Osaka), the gateway to the mainland and away from the capital Asuka, signaling his rising influence both domestically and in foreign affairs. While he had strong sentiments towards Buddhism, Shōtoku also had to oversee military expeditions given the realities of his age. In 600 the court dispatched an expeditionary force against Silla on the Korean peninsula, a period when Shōtoku was starting to overshadow Soga no Umako who had been the de facto leader having installed the reigning empress. Construction of a new palace for the prince at Ikaruga 斑鳩 commenced in 601. In 602 his younger brother was made commander of another expeditionary force against Silla. Shōtoku also cooperated with Soga no Umako in the promotion of Buddhism. In 596 the latter built Hōkō 法興寺 followed by Shōtoku's construction of Hōryū-ji 法隆寺 in 607 at Ikaruga. They had no letters, and just carved wood and tied ropes together. They venerate the Buddhadharma. It was in Paekche [Korea] that they sought and obtained the Buddhist sūtras, which is when they first came to have letters. In 603 the hierarchical system of twelve cap ranks 冠位十二階 was established under the prince, which is thought to have been drafted based on the official ranking system in Baekje with consideration of the Goguryeo system. Again, this highlights the deep Korean influences on early Japanese society. It continued until 647 when the system of thirteen cap ranks 冠位十三階 was established. In 604, Shōtoku is said to have drafted the 'Constitution in Seventeen Articles' 十七條憲法. This document is subject to dispute, but generally it is accepted in the historical record, though perhaps the version recorded in the Nihon Shoki was modified from the original. The second article decrees that the Triple Gem (Buddha, Dharma and Sangha) is to be venerated, effectively establishing Buddhism as a state sanctioned religion. Moreover, it calls for obedience to the state and harmony in the leadership. These reforms were done in the face of refractory elites who neither cared for Buddhism nor the emerging central state. Buddhism was politically useful in that it brought together a large segment of the population under one religious identity whose sole custodian was in theory to be the state. Hence the interests of the faithful and those of the state were aligned. Hokke gisho in Shōtoku's handwriting. Nevertheless it seems the prince was at the same time a devout and learned Buddhist. In his later years he is said to have written three sūtra commentaries: Hokke gisho 法華義疏 (Lotus Sūtra), Yuima kyō gisho 維摩經義疏 (Vimalakīrti Sūtra) and Shōmangyō gisho 勝鬘經義疏 (Śrīmālā Sūtra). Incidentally, there were early Madhyamaka influences in Japan in this period. For instance, the Goguryeo monk Hyeja, a teacher of Shōtoku, and the Baekje monk Hyechong 慧聰 who had arrived in 595 are thought to have assisted Shōtoku in his drafting of the commentaries which show influences from the Sanlun 三論 or Chinese Madhyamaka community (the "Three Treatises" are the Madhyamaka-śāstra and Dvādaśanikāya-śāstra by Nāgārjuna and the Śata-śāstra by Āryadeva). While the authorship of these works is sometimes disputed, it would seem he was a sincere Buddhist given his support for the religion throughout his life. Buddhism under imperial patronage and calls for faith in it facilitated Shōtoku's political aims, though that does not preclude him also being emotionally invested in the religion. 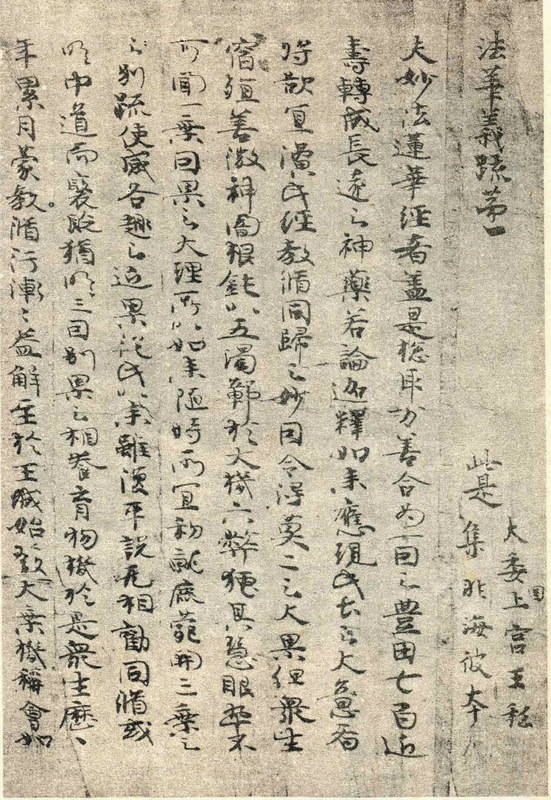 Additionally, in 620 he co-authored with Umako the Kokki 國記 and Tennō ki 天皇記 – a chronicle of the country and chronicle of the emperors respectively. These are no longer extant unfortunately. They presumably offered details on the history of the emerging nation and its leadership. Consequently the oldest extant history of Japan is the Kojiki 古事記 from 712. One other non-extant work from 620 was the Omimuraji tomo no miyatsuko kuni no miyatsuko momoamariyasonotomo wo awasete ōmitakaradomo no mototsufumi 臣連伴造國造百八十部并公民等本記, which possibly detailed the history of the aristocracy. This custom of writing a national history was also a Chinese import. Shōtoku died in 622 at the age of 49 at the Ikaruga Palace 斑鳩, his remains entombed in Shinaga 磯長 at Kawachi 河内, but his legacy carried on. Worship of the prince developed over the following centuries. Shōtoku was already venerated as a the 'Śākyamuni of Japan' by the eighth century. The Nihon Shoki, compiled in 720, as noted above, reports that he could speak when born, an element found in earlier Buddhist literature, and that he possessed sagely wisdom (see fasc. 22). By the Nara 奈良 period (710-794) there were legends he was a bodhisattva. His legends were compiled in the Shōtoku Taishi denryaku 聖德太子傳暦 (also called Shotoku Taishi heishi den 聖德太子平氏傳), attributed to Fujiwara no Kanesuke 藤原兼輔 (877-933) in 917. Another early Heian period (794-1185) work of unknown authorship detailing his legends is the Jōgū Shōtoku Taishi den hoketsuki 上宮聖德太子傳補闕記. Such works consolidated the widespread belief he was an emanation of Guze Kannon 救世觀音 (*Lokanātha Avalokitēśvara Bodhisattva), spurring further literary and artistic developments in the late Heian. We might incidentally consider parallels to the deification of early Tibetan kings by later Buddhists (for a related discussion see my article here). Additionally, such an exulted image extended into the popular performances of Yōkyoku 謡曲 and Kyōgen 狂言. Later the modern nation of Japan came to incorporate the prince into the national iconography. Also in the modern period, particularly after World War II, there has been a number of academic disputes over the historicity of key documents related to Shōtoku. The history I presented above would be generally acceptable in a textbook, but historians dispute a number of details regarding the literature attributed to him or about him. It has even been proposed that the prince in fact never existed and his character is but a fabrication from later times, though this is not a widely accepted position among Japanese historians so far as I know. All of these disputes would take another blog entry to survey and perhaps in the future we might do that. Needless to say, the influence of Shōtoku has extended through the centuries to modern times. His image is still alive and well. For an extensive history of the time period in question see Inoue Mitsuada. “The Century of Reform.” Cambridge History of Japan Volume I. New York: Cambridge University Press, 1993. 3 David J. Lu, Japan A Documentary History (Armonk, NY: M. E. Sharpe, 1997), 23-26.